Stalin, Grigory Zinoviev, and Lev Kamenev formed a ruling triumvirate (a so-called troika, not to be confused with the NKVD troika) in early 1923 after Vladimir Lenin had become incapacitated from a stroke. In the context of the series of defeats of communist revolutions abroad (crucially the German revolutions of 1919 and 1923 but also later the Chinese Revolution of 1927) which left the Russian Revolution increasingly isolated in a backward country, enabled the troika to effect the marginalization of Leon Trotsky in an internal party political conflict over the issue of Stalin's theory of Socialism in One Country. It was Trotsky who most clearly represented the wing of the CPSU leadership which claimed that the survival of the revolution depended on the spread of communism to the advanced European economies especially Germany. This was expressed in his theory of permanent revolution. A few years later, Zinoviev and Kamenev joined the United Front in an alliance with Trotsky which favored Trotskyism and opposed Stalin specifically. Consequently, Stalin allied with Nikolai Bukharin and defeated Trotsky in a power struggle. Trotsky was expelled from the Soviet Union in 1929 and Kamenev and Zinoviev temporarily lost their membership in the Communist Party. Zinoviev and Kamenev, in 1932, were found to be complicit in the Ryutin Affair and again were temporarily expelled from the Communist Party. In December 1934, Sergei Kirov was assassinated and, subsequently 15 defendants were found guilty of direct, or indirect, involvement in the crime and were executed. Zinoviev and Kamenev were found to be morally complicit in Kirov's murder and were sentenced to prison terms of ten and five years, respectively. Both Kamenev and Zinoviev had been secretly tried in 1935 but it appears that Stalin decided that, with suitable confessions, their fate could be used for propaganda purposes. Genrikh Yagoda oversaw the interrogation proceedings. In December 1935, the original case surrounding Zinoviev began to widen into what was called the Trotsky-Zinoviev Center. Stalin allegedly received reports that correspondences from Trotsky were found among the possessions of one of those arrested in the widened probe. Consequently, Stalin stressed the importance of the investigation and ordered Nikolai Yezhov to take over the case and ascertain if Trotsky was involved. The central office of NKVD that was headed by Genrikh Yagoda was shocked when it was known that Yezhov (at that time a mere party functionary)[a] has discovered the conspiracy, due to the fact that they (NKVD) had no relations to the case. This would have led to inevitable conclusion about unprofessionalism of the NKVD leaders who completely missed the existence of the conspiratorial Trotskyist center. In June 1936, Yagoda reiterated his belief to Stalin that there was no link between Trotsky and Zinoviev, but Stalin promptly rebuked him. Bewilderment was strengthened by the fact that both Zinoviev and Kamenev for a long time were under constant operational surveillance and after the murder of Kirov were held in custody. A key role in investigating played a chief of the Secret-political department of the NKVD Main Directory of State Security (a predecessor of KGB), State Security Commissar of the 2nd Class Georgiy Molchanov. The basis of the scenario was laid in confession testimonies of three arrested: NKVD agent Valentin Olberg (ru:Ольберг, Валентин Павлович) who was teaching at the Gorky Pedagogic Institute and two former participants of the internal party opposition and Soviet statesmen Isaak Rejngold and Richard Pikel. Wherein Rejngold firmly believed that participating in the case fabrication about mythical conspiracy he executes the party's task. 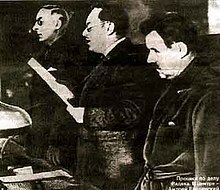 In relation to their composition, the testimonies looked standard conspiratorial activity, murder of Kirov, preparation to assassination attempts against the leaders of the Communist Party of the Soviet Union, seizure of power in the Soviet Union with the aim of "restoration of capitalism". In July 1936, Zinoviev and Kamenev were brought to Moscow from an unspecified prison. They were interrogated and denied being part of any Trotsky-led conspiracy. Yezhov appealed to Zinoviev's and Kamenev's devotion to the Soviet Union as old Bolsheviks and advised them that Trotsky was fomenting anti-Soviet sentiment amongst the proletariat in the world. Throughout spring and summer of 1936 the investigators were requesting from the arrested "to lay down arms in front the party" exerting a continuous pressure on them. Furthermore, this loss of support, in the event of a war with Germany or Japan, could have disastrous ramifications for the Soviet Union. To Kamenev specifically, Yezhov showed him evidence that his son was subject to an investigation that could result in his son's execution. According to one witness, at the beginning of the summer the central heating was turned on in Zinoviev's and Kamenev's cells. This was very unpleasant for both prisoners but particularly Zinoviev who was asthmatic and couldn't tolerate the artificially increased temperatures. Finally the exhausted prisoners agreed to a deal with Stalin who promised them, on the behalf of Politburo, their lives in exchange for participation in the anti-Trotskyist spectacle. Kamenev and Zinoviev agreed to confess on condition that they receive a direct guarantee from the entire Politburo that their lives and those of their families and followers would be spared. When they were taken to the supposed Politburo meeting, they were met by only Stalin and Kliment Voroshilov. Stalin explained that they were the "commission" authorized by the Politburo, and Stalin agreed to their conditions in order to gain their desired confessions. After that the future defendants were given some medical treatment and food. Not to be confused with Trial of the Sixteen. The trial was held from August 19 to August 24, 1936 in the small October Hall of the House of the Unions (chosen instead of the larger Hall of Columns, used for earlier trials) and there were 16 defendants. The main charge was forming a terror organization with the purpose of killing Joseph Stalin and other members of the Soviet government. They were tried by the Military Collegium of the Supreme Court of the USSR, with Vasili Ulrikh presiding. The Prosecutor General was Andrei Vyshinsky, a former member of the Mensheviks who in 1917 had signed an order to arrest Lenin. Defendant Ivan Nikitich Smirnov was blamed by his co-defendants for being the leader of the Center which planned Kirov's assassination. He, however, had been in prison since January 1933 and refused to confess. Another defendant, the Old Bolshevik Eduard Holtzman, was accused at the Trial of the 16 of conspiring with Trotsky in Copenhagen at the Hotel Bristol in 1932, where Trotsky was giving a public lecture. A week after the trial it was revealed by a Danish Social Democratic newspaper that the hotel had been demolished in 1917. All the defendants were sentenced to death and were subsequently shot in the cellars of Lubyanka Prison in Moscow. The second trial occurred between January 23 and January 30, 1937. This second trial involved 17 lesser figures including Karl Radek, Yuri Piatakov and Grigory Sokolnikov. Alexander Beloborodov was also arrested and intended to be tried along with Radek, but did not make the confession required of him, and so he was not produced in court. Thirteen of the defendants were eventually executed by shooting. The rest received sentences in labour camps. Radek was spared as he implicated others, including Nikolai Bukharin, Alexei Rykov, and Marshal Mikhail Tukhachevsky, setting the stage for the Trial of Military and Trial of the Twenty One. Radek provided the pretext for the purge on a massive scale with his testimony that there was a "third organization separate from the cadres which had passed through [Trotsky's] school" as well as "semi-Trotskyites, quarter-Trotskyites, one-eighth-Trotskyites, people who helped us, not knowing of the terrorist organization but sympathizing with us, people who from liberalism, from a Fronde against the Party, gave us this help." By the third organization, he meant the last remaining former opposition group called Rightists led by Bukharin, whom he implicated by saying: "I feel guilty of one thing more: even after admitting my guilt and exposing the organisation, I stubbornly refused to give evidence about Bukharin. I knew that Bukharin's situation was just as hopeless as my own, because our guilt, if not juridically, then in essence, was the same. But we are close friends, and intellectual friendship is stronger than other friendships. I knew that Bukharin was in the same state of upheaval as myself. That is why I did not want to deliver him bound hand and foot to the People's Commissariat of Home Affairs. Just as in relation to our other cadres, I wanted Bukharin himself to lay down his arms." In view of the character of the accused, their long terms of service, their recognized distinction in their profession, their long-continued loyalty to the Communist cause, it is scarcely credible that their brother officers ... should have acquiesced in their execution, unless they were convinced that these men had been guilty of some offense. [*] It is generally accepted by members of the Diplomatic Corps that the accused must have been guilty of an offense which in the Soviet Union would merit the death penalty. * The Bukharin trial six months later developed evidence which, if true, more than justified this action. Undoubtedly those facts were all full known to the military court at this time. The Tukhachevsky Affair was a secret trial before a military tribunal of a group of Red Army generals, including Mikhail Tukhachevsky, in June 1937. It featured the same type of frame-up of the defendants and it is traditionally considered one of the key trials of the Great Purge. Mikhail Tukhachevsky and the senior military officers Iona Yakir, Ieronim Uborevich, Robert Eideman, August Kork, Vitovt Putna, Boris Feldman, and Vitaly Primakov were accused of anti-Communist conspiracy and sentenced to death; they were executed on the night of June 11/June 12, immediately after the verdict delivered by a Special Session of the Supreme Court of the USSR. This trial triggered a massive purge of the Red Army. The fact that Yagoda was one of the accused showed the speed at which the purges were consuming its own. Meant to be the culmination of previous trials, it now alleged that Bukharin and others had conspired to assassinate Lenin and Stalin numerous times after 1918 and had murdered Soviet writer Maxim Gorky by poison in 1936. The group also stood accused of espionage. Bukharin and others were claimed to have plotted the overthrow and territorial partition of the Soviet Union in collusion with agents of the German and Japanese governments, among other preposterous charges. Even sympathetic observers who had stomached the earlier trials found it hard to swallow the new charges as they became ever more absurd, and the purge had now expanded to include virtually every living Old Bolshevik leader except Stalin. The preparation for this trial was delayed in its early stages due to the reluctance of some party members to denounce their comrades. It was at this time that Stalin personally intervened to speed up the process and replaced Yagoda with Yezhov. Stalin also observed some of the trial in person from a hidden chamber in the courtroom. On the first day of the trial, Krestinsky caused a sensation when he repudiated his written confession and pleaded not guilty to all the charges. However, he changed his plea the next day after "special measures", which dislocated his left shoulder among other things. Anastas Mikoyan and Vyacheslav Molotov later claimed that Bukharin was never tortured, but it is now known that his interrogators were given the order, "beating permitted," and were under great pressure to extract confessions out of the "star" defendant. Bukharin held out for three months, but threats to his young wife and infant son, combined with "methods of physical influence" wore him down. But when he read his confession, amended and corrected personally by Stalin, he withdrew his whole confession. The examination started all over again, with a double team of interrogators. Bukharin's confession in particular became the subject of much debate among Western observers, inspiring Koestler's novel Darkness at Noon and a philosophical essay by Maurice Merleau-Ponty in Humanism and Terror among others. His confessions were somewhat different from others in that, while he pleaded guilty to general charges, he denied knowledge of any specific crimes. Some astute observers noted that he would allow only what was in his written confession and refused to go any further. The fact that he was allowed to write in prison (he wrote four book-length manuscripts including an autobiographical novel, How It All Began, a philosophical treatise, and a collection of poems – all of which were found in Stalin's archive and published in the 1990s) suggests that some kind of deal was reached as a condition for his confession. He also wrote a series of emotional letters to Stalin, protesting his innocence and professing his love for Stalin, which contrasts with his critical opinion of Stalin and his policies as expressed to others and with his conduct in the trial. There are several possible interpretations of Bukharin's motivation (besides coercion) in the trial. Koestler and others viewed it as a true believer's last service to the Party (while preserving a modicum of personal honor), whereas Bukharin's biographers Stephen Cohen and Robert Tucker saw traces of Aesopian language, with which Bukharin sought to turn the tables and conduct a trial of Stalinism (while still keeping his part of the bargain to save his family). Bukharin himself speaks of his "peculiar duality of mind" in his last plea, which led to "semi-paralysis of the will" and Hegelian "unhappy consciousness". Romain Rolland and others wrote to Stalin seeking clemency for Bukharin, but all the leading defendants were executed except Rakovsky and two others (they were killed in prison in 1941). Despite the promise to spare his family, Bukharin's wife, Anna Larina, was sent to a labor camp, but she survived. Communist Party leaders in most Western countries denounced criticism of the trials as capitalist attempts to subvert Communism. A number of American communists and progressive "fellow travellers" outside of the Soviet Union signed a Statement of American Progressives on the Moscow Trials. These included Langston Hughes and Stuart Davis, who would later express regrets. Some contemporary observers who thought the trials were inherently fair cite the statements of Molotov, who while conceding that some of the confessions contain unlikely statements, said there may have been several reasons or motives for this – one being that the handful who made doubtful confessions were trying to undermine the Soviet Union and its government by making dubious statements in their confessions to cast doubts on their trial. Molotov postulated that a defendant might invent a story that he collaborated with foreign agents and party members to undermine the government so that those members would falsely come under suspicion, while the false foreign collaboration charge would be believed as well. Thus, the Soviet government was in his view the victim of false confessions. Nonetheless, he said the evidence of mostly out-of-power Communist officials conspiring to make a power grab during a moment of weakness in the upcoming war truly existed. This defense collapsed after the release of Khrushchev's Secret Speech to the Twentieth Congress. In Britain, the lawyer and Labour MP Denis Nowell Pritt, for example, wrote: "Once again the more faint-hearted socialists are beset with doubts and anxieties," but "once again we can feel confident that when the smoke has rolled away from the battlefield of controversy it will be realized that the charge was true, the confessions correct and the prosecution fairly conducted", while socialist thinker Beatrice Webb "was pleased that Stalin had 'cut out the dead wood'". Communist Party leader Harry Pollitt, in the Daily Worker of March 12, 1936, told the world that "the trials in Moscow represent a new triumph in the history of progress". The article was ironically illustrated by a photograph of Stalin with Yezhov, himself shortly to vanish and his photographs airbrushed from history by NKVD archivists. In the United States, left-wing advocates such as Corliss Lamont and Lillian Hellman also denounced criticism of the Moscow trials, signing An Open Letter To American Liberals in support of the trials for the March 1937 issue of Soviet Russia Today. In the political atmosphere of the 1930s, the accusation that there was a conspiracy to destroy the Soviet Union was not incredible, and few outside observers were aware of the events inside the Communist Party that had led to the purge and the trials. However, the Moscow trials were generally viewed negatively by most Western observers including many liberals. The New York Times noted the absurdity in an editorial on March 1, 1938: "It is as if twenty years after Yorktown somebody in power at Washington found it necessary for the safety of the State to send to the scaffold Thomas Jefferson, Madison, John Adams, Hamilton, Jay and most of their associates. The charge against them would be that they conspired to hand over the United States to George III." For Bertram Wolfe, the outcome of the Bukharin trial marked his break with Stalinism. In May 1937, the Commission of Inquiry into the Charges Made against Leon Trotsky in the Moscow Trials, commonly known as the Dewey Commission, was set up in the United States by supporters of Trotsky, to establish the truth about the trials. The commission was headed by the noted American philosopher and educator John Dewey, who led a delegation to Mexico, where Trotsky lived, to interview him and hold hearings from April 10 to April 17, 1937. The hearings were conducted to investigate the allegations against Trotsky who publicly stated in advance of them that if the commission found him guilty as charged he would hand himself over to the Soviet authorities. They brought to light evidence which established that some of the specific charges made at the trials could not be true. That while confessions are necessarily entitled to the most serious consideration, the confessions themselves contain such inherent improbabilities as to convince the Commission that they do not represent the truth, irrespective of any means used to obtain them." For example, in Moscow, Pyatakov had testified that he had flown to Oslo in December 1935 to "receive terrorist instructions" from Trotsky. The Dewey Commission established that no such flight had taken place. In Britain, the trials were also subject to criticism. A group called the British Provisional Committee for the Defence of Leon Trotsky was set up. In 1936, the Committee published an open letter in the Manchester Guardian calling for an international inquiry into the Trials. The letter was signed by several notable figures, including H. N. Brailsford, Harry Wicks, Conrad Noel, Frank Horrabin and Eleanor Rathbone. The Committee also supported the Dewey Commission. Emrys Hughes, the British MP, also attacked the Moscow Trials as unjust in his newspaper Forward. All of the surviving members of the Lenin-era party leadership except Stalin and Trotsky, were tried. By the end of the final trial Stalin had arrested and executed almost every important living Bolshevik from the Revolution. Of 1,966 delegates to the party congress in 1934, 1,108 were arrested. Of 139 members of the Central Committee, 98 were arrested. Three out of five Soviet marshals (Alexander Ilyich Yegorov, Vasily Blyukher, Tukhachevsky) and several thousands of the Red Army officers were arrested or shot. The key defendant, Leon Trotsky, was living in exile abroad, but he still did not survive Stalin's desire to have him dead and was assassinated by a Soviet agent in Mexico in 1940. While Khrushchev's Secret Speech denounced Stalin's personality cult and purges as early as 1956, rehabilitation of Old Bolsheviks proceeded at a slow pace. Nikolai Bukharin and 19 other co-defendants were officially completely rehabilitated in February 1988. Yagoda, who was deeply involved in the great purge as the head of NKVD, was not included. In May 1988, rehabilitation of Zinoviev, Kamenev, Radek, and co-defendants was announced. The commission has become acquainted with a large quantity of materials in the NKVD archives and with other documents and has established many facts pertaining to the fabrication of cases against Communists, to glaring abuses of Socialist legality which resulted in the death of innocent people. It became apparent that many party, Government and economic activists who were branded in 1937–38 as 'enemies,' were actually never enemies, spies, wreckers, etc., but were always honest Communists ... They were only so stigmatized and often, no longer able to bear barbaric tortures, they charged themselves (at the order of the investigative judges – falsifiers) with all kinds of grave and unlikely crimes. It is now known that the confessions were given only after great psychological pressure and torture had been applied to the defendants. From the accounts of former GPU officer Alexander Orlov and others the methods used to extract the confessions are known: repeated beatings, torture, making prisoners stand or go without sleep for days on end, and threats to arrest and execute the prisoners' families. For example, Kamenev's teenage son was arrested and charged with terrorism. After months of such interrogation, the defendants were driven to despair and exhaustion. In January 1989, the official newspaper Pravda reported that 25,000 persons had been posthumously rehabilitated. Koestler, Arthur (1980). Darkness at Noon. London: The Folio Society. ^ Vadim Z Rogovin, 1937: Stalin's Year of Terror (Mehring books 1998; ISBN 0-929087-77-1): xvii. ^ Ward, Chris (1993). Stalin's Russia. London: Edward Arnold. ^ Trotsky, LD (1931). "The Permanent Revolution & Results and Prospects". Marxists Internet Archive. Progress Publishers. Retrieved 6 July 2014. ^ Orlov: 24–25; cf. Lenoe: 376–379. ^ Robert Conquest, The Great Terror: A Reassessment (Oxford University Press, 1990; ISBN 0195071328), p. 91. ^ Delap Sean, Dictatorship and Democracy. ^ (in Spanish) Bernard Michal. Los Grandes Procesos de la Historia. Los Procesos de Moscú. Tomo I. Ed Circulo de Amigos de la Historia. Editions de Crémille-Genéve. Printed in Barcelona, Spain. pp. 217–219. Sentence signed by V. Ulrich, I Matulevich and H. Rychokv, sentencing to be shot: Yuri Piatakov, Leonid Serebriakov, Nicolai Muralov, Yakov Livchits, Mijail Boguslavski, Ivan Kniazev, Stanislas Rataichak, Boris Norkin, Alexei Chestov, Iossif Tutok, Gavriil Pushin and Ivan Hrasche. 10 years in prison: Grigori Sokolnikov, Karl Radek and Valentin Arnold. 8 years in prison: Mijail Etroilov. ^ Conquest 1990, p. 164. ^ Davies, Joseph E. Mission to Moscow. Garden City: Garden City Press, 1941. ^ Conquest 1990, p. 352. ^ Conquest 1990, pp. 364–365. ^ Snyder 2010, p. 74. ^ Redman 1958, pp. 44–53. ^ Wolfe 1990, pp. 10–15. ^ Paul Corthorn, In the shadow of the dictators: the British Left in the 1930s. London, Tauris Academic Studies, 2006, ISBN 1850438439, (p. 215). ^ Orlov 1953, p. ? The Case of the Trotskyite-Zinovievite Terrorist Centre Head before the Military Collegium of the Supreme Court of the USSR. Moscow, August 19-24, 1936. Moscow 1936. Report of Court Proceedings in the Case of the Anti-Soviet Trotskyite Centre. Heard before the Military Collegium of the Supreme Court of the U.S.S.R., Moscow, January 23-30, 1937. Moscow 1937. Report of Court Proceedings in the Case of the Anti-Soviet "Bloc of Rights and Trotskyites". Heard before the Military Collegium of the Supreme Court of the U. S. S. R, Moscow, March 2- 13, 1938. Moscow 1938. Conquest, Robert (1990). The Great Terror: A Reassessment. New York: Oxford University Press. ISBN 0-19-505580-2. Leno, Matthew L. (2010). The Kirov Murder and Soviet History. New Haven: Yale University Press ISBN 978-0-300-11236-8. Orlov, Alexander (1953). The Secret History of Stalin's Crimes. Random House, Inc.
Rogovin, Vadim Z. (1998). 1937: Stalin's Year of Terror. Oak Park, MI: Mehring Books, Inc. ISBN 0-929087-77-1. Tucker, Robert C. (1973). Stalin as Revolutionary, 1879–1929: A Study in History and Personality. New York: Norton. ISBN 0-393-05487-X. Wolfe, Bertram David (1990). Breaking with Communism: The Intellectual Odyssey of Bertram D. Wolfe. Stanford: Hoover Institution Press. ISBN 0-8179-8881-5. Getty, J. Arch and Naumov, Oleg V. (2010). The Road to Terror: Stalin and the Self-destruction of the Bolsheviks, 1932–1939. New Haven: Yale University Press. ISBN 978-0-300-10407-3. Goldman, Wendy Z. (2011). Inventing the Enemy: Denunciation and Terror in Stalin's Russia. New York: Cambridge University Press. ISBN 978-0-521-19196-8.